Would you believe there are four hundred of these things in the archive now? I’m looking at the WordPress dashboard and still can’t quite believe my eyes. I don’t know what the final count will be; my slight mania for round numbers may or may not manifest. We’ll all find out come May, won’t we? Well, here we are, somewhere near the midpoint of the “year” of Quacked Panes. Where do things stand? There are over 380 of these things in the archive. We’ll clear 400 before we’re done, with room to spare. The new backdrop is working well, though it’s already looking a bit the worse for wear. 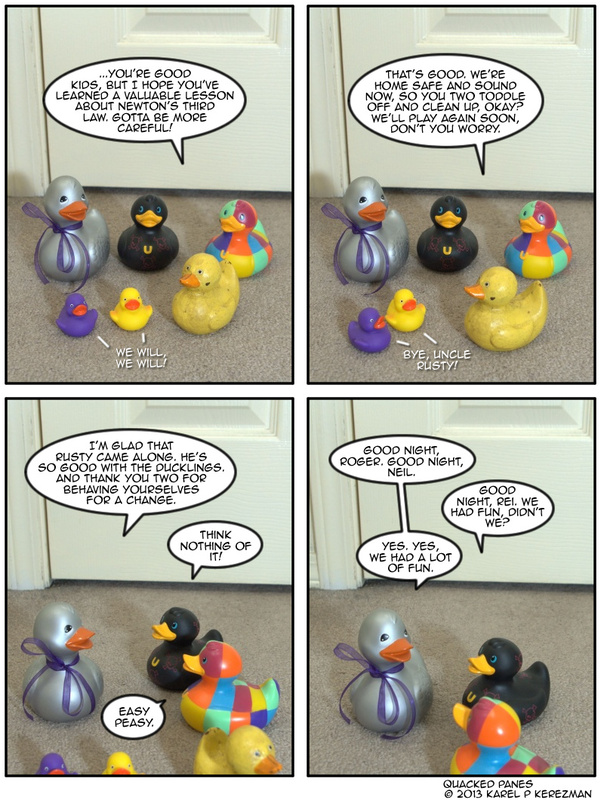 A few new ducks have made it into the comic, though none as headliners. Plans are not yet finalized (yes, with very little time to go) for this year’s Christmas special. We’ll see. Year Four is the final year of full-time regularly-scheduled Quacked Panes comic production. I’m not shutting down the site or anything like that, but… I accomplished most of what I set out to do, and the things I didn’t accomplish are either outside my grasp & skillset or not important enough to me to pursue. I learned some skills, told some good and some terrible jokes, and held to a twice-per-week release schedule essentially without fail for three and a half years & counting. Year Four will still wrap up next Spring, mind you, at the usual time. I’m not done here, yet. And I reserve the option to add new comics down the road as the whim strikes, or even to pick up a regular schedule at some later date. But the bulk of this experiment is over, and I want to end the main production run cleanly before I truly start to burn out. Thank you, one and all, for your patronage and your comments and your support. It wouldn’t have been even half as much fun without you.